The AMX 40 is a French tier 4 light tank. One of the most futuristic tanks of its time, with unique thick and rounded armour. There is almost no straight angled part on the hull and turret which gives it good shot deflection abilities. 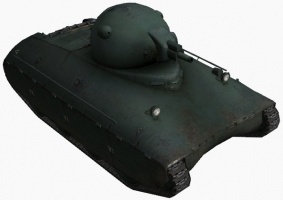 In game, it plays more like a heavy medium or heavy tank. It is a cumbersome vehicle that barely scratches the 20km/h mark on flat ground, and has a slow firing gun to "compliment" its sluggishness. Players often call it the "Duck" in game due to its shape. 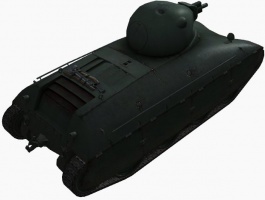 Because of the poor gun, poor mobility and obsolescence against higher-tier tanks, it is often considered alongside the M3 Lee as one of the worst vehicles in the game. While the armor sloping is impressive, the 60 to 70mm of base armor means that protection peaks at 130mm without angling, and a lot of guns on your tier can penetrate you if you aren't positioned right (especially from TDs). Nonetheless, while it's far from an insight to future French light tanks, it's a pretty good platform to practice the traditional methods of driving heavy armored tanks. The AMX 40 leads to the AMX ELC bis. Like all low tier French tanks, it suffers from poor speed and maneuverability. Its top speed can only be reached when it is going downhill, and its effective top speed on flat terrain is little more than 20 kilometers per hour. In addition, while it has thicker armour than the AMX 38, it will be facing much higher tier opponents capable of penetrating it. Try to avoid high-tier tanks unless you can flank them to get a shot at their weaker side and rear armor. The first guns are woefully inadequate for its tier, with only the final gun, the 75mm SA32, providing decent punch. To equip this gun requires a turret upgrade (with increased armor thickness but slower traverse) and since the tank at stock is nearly at the load limit, this will also require a suspension upgrade. The AMX 40 can be a versatile tank. Depending on the teams, maps, position in the list, and the availability of equipment, modules, you can choose from a variety of tactics. Fully upgraded, the AMX 40 can take on nearly every tank at its tier and below but will be left defenseless if caught in the open by higher tier vehicles. At the top of the list: When it's one of the higher tanks, which isn't often, the AMX 40 is a considerable force, especially when fully upgraded. The armour will bounce a lot of Tier 3 and 4 shots, and the gun is good for a Tier 4. However, this does not mean a player should go rushing in, though the term "rushing" may be an overstatement for the AMX 40. When it's at the top of the list, play the AMX 40 as a frontliner. Dawdle forwards at 15-20km/h and keep firing; don't give the enemy a chance to advance on you, because you will never get away. Keep moving with the full support of a few allies and you can use the AMX's armour to the best of its ability. 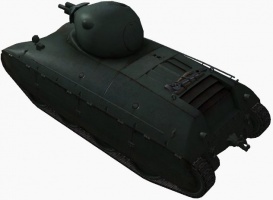 Angling and wiggling your tank will improve your chance to bounce shots and throw enemies off. In the middle of the list: In the middle of the list, which is where the AMX will find itself the most, its once superior armor is no longer the dominant power. While your gun and armor will still be effective to some Tier 5's, there are more guns which will now be effective against you. Bear in mind you will be destroyed in a mere 12 seconds from a T-34 or you could be one-shotted by a KV-1 with its 122mm. The AMX, at this level, is best used in two ways; it can be used to defend artillery from rushing scouts (who usually have low armor and bad guns), or it can be used as a mobile watchtower, where its average view range will help, but its dismal speed and radio will hinder it somewhat. You should not go out on your own and try to stick with tanks that are tough and cannot be destroyed easily. At the bottom of the list: You are dead weight to the team. Your armor is worthless and your gun even more so. At this tier, the low speed is what will kill you. Even the frontal armor of the M4A3E8 Sherman Easy Eight will be troublesome for the gun, without angling. The AMX 40 should be employed as a stationary watchtower in areas where the team is less concentrated, such as little-used corridors. This will negate the slow speed, poor gun and enable it to utilize its light tank buff. Combined with a Sixth-Sense skill, it can warn allies of incoming armor, and allow them to respond. However, it will often be incapable of responding itself, due to the poor cannon. If necessary, it is possible to sacrifice itself as a roadblock, though the meager 20-ton weight will mean even Sherman tanks would be able to push it away and should only be considered as a last resort. Some players recommend using the stock turret as it is more rounded, has a better mantlet, and better gun depression. You will have to use the 47mm SA35, but the 75mm isnt much better. The AMX 40 will often be faster on flat ground if driven backwards. However, this is not recommended, as you will expose your weak rear armor. One way to counter the poor penetration on the 75mm gun is to only carry HE. The ER 53 radio and the 47 mm SA35 gun carry over from the AMX 38. The stock suspension is completely maxed out, so researching the upgraded suspension first is a must. Research the 47 mm SA35 next. Continue by researching the Somua LM engine. After that research the second turret and the 75 mm SA32. In March 1940, the Workshop of Issy-les-Moulineaux was studying a new medium tank of cavalry, the successor of the SOMUA S-35 and the S-40. The design was never built, due to the Fall of France in June 1940. The AMX 40 Cavalry was designed as a medium tank, modelled along very futuristic lines. Its rounded hull offers only oblique surfaces; the undercarriage consists of four road wheels which was very modern for a 1940s tank. Its general hullform resembles that of postwar tanks. The tank had a cast steel body, 60mm front armor, side 50 to 30 mm and 40 mm to the rear. Length 5.30 m, width 2.45 m The chassis was composed of four-wheel drive twin 82cm in diameter protected with side shields. The two rear wheels are driven, which could allow the movement without the tracks. There were no return rollers; the drive sprocket is at the rear. Fuel tanks placed above the tracks were expected to help strengthen the lateral protection (the AMX-40 was to be diesel-fueled; unlike gasoline, diesel is not flammable at room temperature). The AMX was expected to be powered by a diesel engine of 160 hp, low compared to the SOMUA's 190 hp and the S-40's 220 hp engines, for a vehicle with an estimated weight very close to the SOMUA (nearly 20 tonnes). However, the rotation system could save significant weight and provide good performance despite the power deficit. As mentioned earlier, the choice of diesel fuel improves safety. 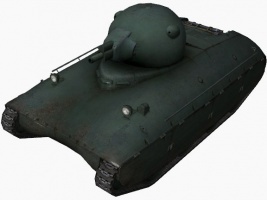 The two-man turret casting has an ovoid shape reminiscent of the future Russian tanks of the T-54/T-55 family. Access was to be through a 60cm-diameter circular hatch on the back of the turret. The hatch follows the general shape of the turret, which has no protrusions except for two openings in the rangefinder. Visibility was to be provided by a panoramic periscope on top of the turret. No slot vision seems to have been planned. The solution is attractive in terms of protection, but the concentration of the tank's visibility into a single element would have adverse consequences in the event of damage to the periscope. The main armament was expected to be an SA 35 47mm cannon, placed on the axis of the turret. Turret rotation was hydraulic, rather than hand-cranked. Breaking with the custom of one-man turrets, the AMX-40 was to have a dedicated gunner along with the commander in the turret. Both occupants sat on a swivelled strap with the turret gunner on the left and the commander on the right. In addition to the 47mm gun, the tank had a secondary armament of two 7.5 mm machine guns- one co-axial with the main gun for close defense, and one on a retractable swivel joint in a compartment behind the turret for anti-air defense. 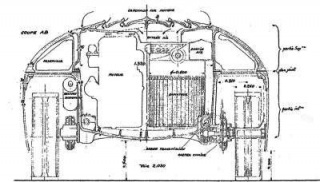 The tank could hold up to 156 rounds of 47mm, distributed in the periphery of the turret in rotating part lockers, to facilitate access to ammunition. The ammunition supply is higher by almost 50% than in the SOMUA. The driver was centrally located in the front, with the dashboard is in the center of the steering wheel driving, such as how the Leclerc has not innovated on that. The driver's position is surrounded on both sides of a storage system chain for around 30 magazines of 7.5mm ammunition. This system used to access all of the stock without moving. Magazines are positioned in the turret for immediate use. The AMX 40 is as a potential successor to SOMUA S 35. The S 40 S 35 which is only improved, particularly at the undercarriage, can no longer ensure a transitional role. Compared to SOMUA, this prototype's dimensions are nearly the same. The AMX is slightly shorter and less high but wider 33cm which should improve its capabilities in all terrain. * The top turret is from the unrelated Renault Char G1. There were never any plans to fit that turret onto the AMX 40. 1940 CHAR MOYEN AMX 40 at chars-francais.net Photos, specs, and brief history in French. This page was last modified on 8 June 2018, at 18:32.